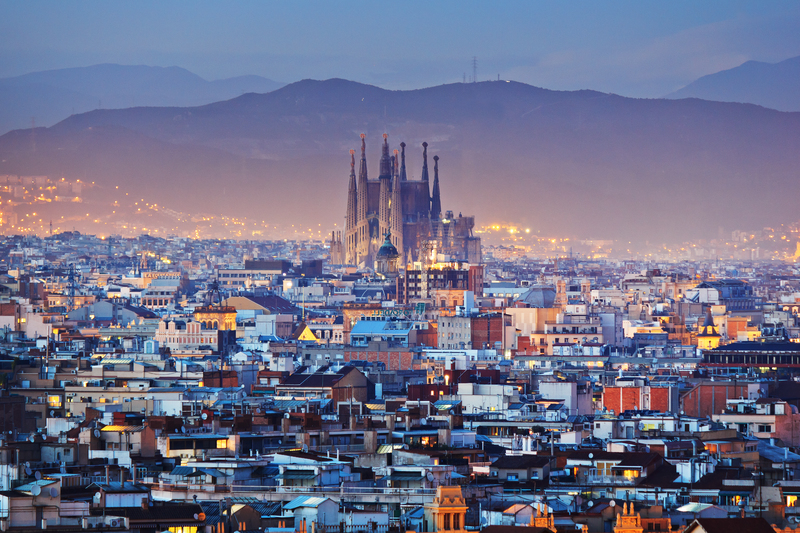 Barcelona is an incredible city to visit year-round with an endless list of things to do, eat, drink, and experience. 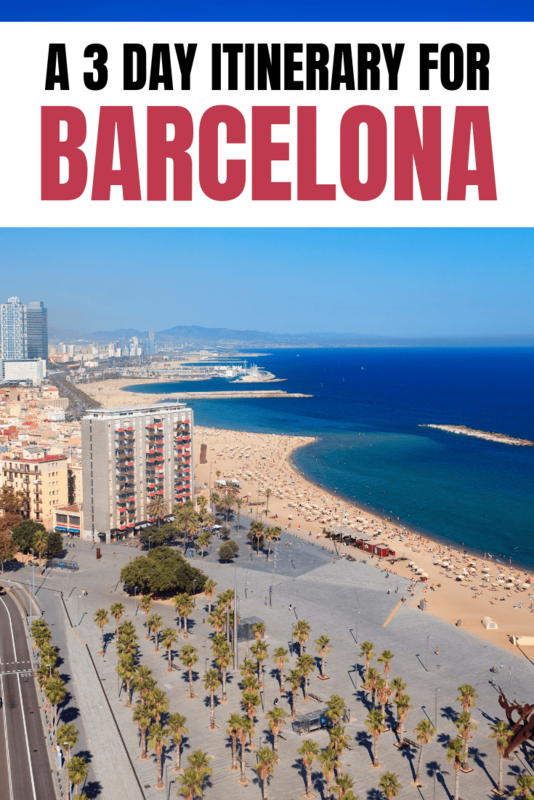 This itinerary for 3 days in Barcelona includes a variety of Barcelona’s attractions for you to experience rather than focusing on one thing. The weather in Barcelona is tourist-friendly all year around, but if there’s rain in the forecast make sure you visit Montserrat on the nicest day. In saying that, the daylight hours over winter are shorter (9.5 hours in December/January) and with average temperatures of 14 degrees (high) and 8 degrees (low) it isn’t exactly warm. Thus Barcelona is a great place to visit in the shoulder seasons. Think late April/May and September/early October so you avoid the peak crowds, yet the weather is still warm. Barcelona is a great city transport wise too (enough with the praise right?). If you were to stay in the city center, you could use your two feet to reach the majority of the destinations in this itinerary with the odd assist from public transport. But if you like the freedom of having your own transport, there are lots of companies offering car rentals in Barcelona. The order of activities in this itinerary is in the order I think is best but it’s up to you. It’s not a strict itinerary with plenty of free time to explore places in depth and/or add (people watching, perhaps). Begin the morning by walking the streets en route to the meeting point for the walking tour (I list them below). Grab a bite to eat somewhere as you’ll be on your feet a lot today. There’s no better way to start the day with a walk in a new city and see what you stumble across. There are several companies who run free walking tours, most of them take you through the Gothic Quarter. Try and get a 10 am start to maximize the rest of your day, but if that’s not possible, take an 11 am tour. They all take ~2.5 hours and if you arrive early you’ll meet some of your fellow walking tour guests which is a great way to make new friends. You can more info about three free walking tours here, here, and here. Note: while the tours are free, you should donate a few euros to the guide at the end. One thing I wasn’t expecting about swimming in Barcelona is for the sea to be cold. For some reason, I associated the Mediterranean Sea with warmth. You can still go swimming as many do, but this is something I’d like to have known beforehand! 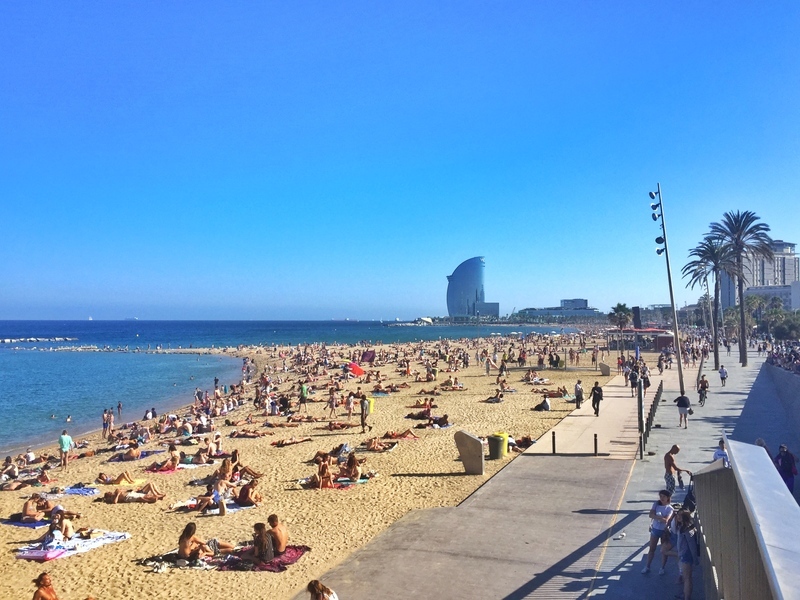 Barceloneta is the go-to beach in Barcelona. After the walking tour, you can walk here in 30 minutes or so, or take the metro. Before getting onto the beach, there are plenty of places to eat along the beachfront. They are on the pricier side so another option is to get some food from a supermarket for a picnic on the beach. Alcohol? It’s not allowed by law, but a lot of people will be having a drink on the beach and aren’t too fussed about hiding hiding the drinks when the patrols come through. Behave sensibly and take your rubbish with you when you leave and you’ll be fine. You’ll also come across hawkers who sell various types of ‘drinks’, and there are several beach bars with waiters that’ll serve you drinks in plastic cups or cans right onto the beach (if you’re close to the hut). 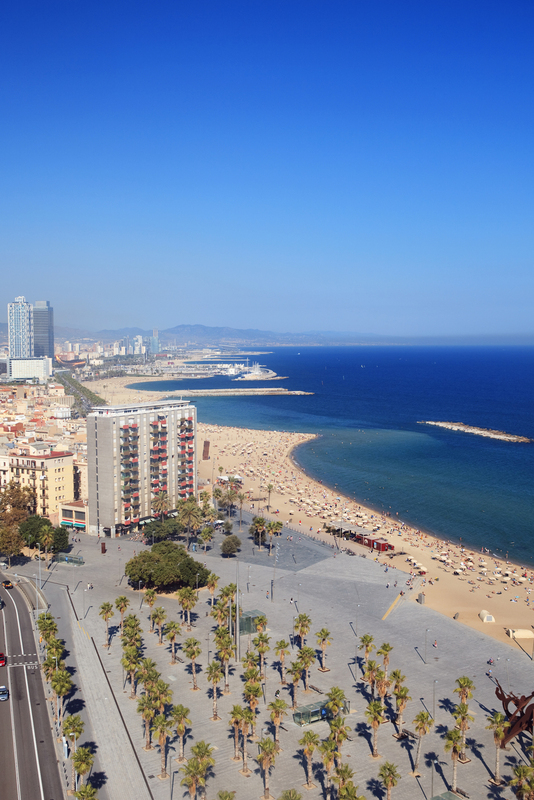 The beachfront has plenty of space to walk along (thanks to the development before the 1992 Barcelona Olympics) with some famous artworks by Rebecca Horn and Frank Gehry. Not a beach person? That was me when I visited Barcelona. Yet, you should spend a couple hours around the beach. Even if you stick to having a meal (paella) and walking along the beach front, you’ll be entertained. Barcelona is an active city and there’s always someone doing something that’s a little bit different (fashion included). In terms of watersports, you can find kiosks offering kitesurfing, windsurfing, and stand up paddleboarding. This day might seem light on activities, but they’re both taxing activities. For the rest of the day and into the evening spend time along La Rambla, a tourist hot spot (be careful of pickpockets). There are two small service roads that run the length of La Rambla, with pedestrian traffic in the wide pavement between the service roads and on the footpaths on the outside of them. As a tourist hotspot there are souvenir shops, kiosks, buskers, and street traders scattered between permanent cafes and restaurants. Take a walk along the length of the street and take it all in. On the west side of La Rambla is the El Raval neighbourhood. It is full of bars, clubs, cafes, and restaurants along with several museums, and historic sites. It’s also home to one of Hemingway’s favourite places for a drink, Bar Marsella. This is also a good chance to get some photos from some of the sites in the Gothic Quarter (east of La Rambla) you didn’t get a chance to get during the walking tour. That’s day one in Barcelona complete after some tacos for dinner. You got to learn lots about the city from a local on a walking tour, experienced the beach life that the Spanish love, and explored La Rambla and possibly the El Raval neighbourhood. If you’re a nightlife kind of person, there are clubs and pubs going every night of the week. There are several companies who organise pub crawls, otherwise, you could do worse than following your nose. And yes, non-football fans should visit. You’ll learn about the culture of Barcelona at the museum and make friends jealous with a photo pitchside. Camp Nou is home to FC Barcelona, one of the most recognizable football clubs in the world. And with such a large global following, many who visit Camp Nou when in Spain, they’ve created a museum and stadium tour that not only does well to ensure people have enough space throughout the tour but it’s also made it not necessary to have a guide to maximise the experience. I recommend buying the audio tour as there are so many artifacts and bits of information it can be overwhelming. The audio tour highlights the most interesting phases in FC Barcelona’s history, not only in regards to the players and games but how the club has shaped Barcelona and influenced the cities culture since 1899. It’s a great tour, and because you can take the stadium tour without a guide you aren’t rushing to get all the photos you want. 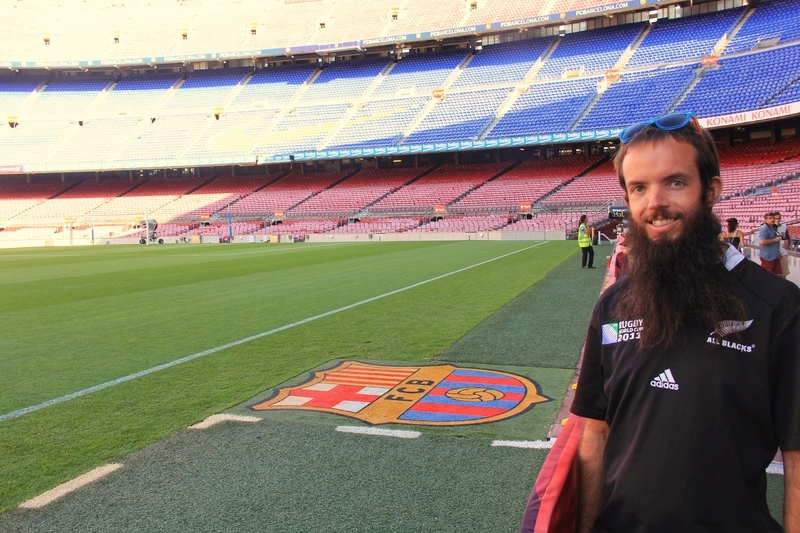 You can read my full Camp Nou tour review here. Note: The Sagrada Familia was the attraction to first reach 100,000 reviews on TripAdvisor which makes it both a must visit, but also a busy place. If you end up with some time before your entry time, take a walk around the park next to the Sagrada Familia and grab a bite to eat. There are plenty of restaurants on the surrounding blocks. There are lots of different ticketing options for visiting Gaudi’s masterpiece that is still under construction. If you aren’t too interested in architecture or Gaudi’s work, stick to the basic ticket and spend 20 minutes inside the building. For those fascinated, you might be there for up to 90 minutes. *If you’re visiting in the height of summer book your tickets in the morning before Camp Nou, or online on the Official site. Next up, Park Güell which is on Carmel Hill and less than 2km from where we’ll watch the sunset. You can walk up the hill to the park from the Sagrada Familia (about 2km), or drive/catch public transport if you desire. Park Güell is a UNESCO World Heritage Site thanks to Antoni Gaudi who designed many of the structures during the construction of the park in the early 1900’s, during designs Naturalist phase. You can buy your tickets online in advance and expect to spend 1.5-2 hours here, with lots of photo opportunities, city views, hidden areas off the beaten path, and of course admire the architecture. If you’re interested, choose the option with a tour guide, but the park is a great place to explore on your own. If the sunset is still an hour or so away, it’s time to head across Carmel Hill to the bunkers.This is the must-watch sunset spot in Barcelona so there will be lots of fellow sunset viewers. The earlier you get there the better vantage point you’ll have but there are epic views in all directions. It’s a great place to enjoy a beer or share a bottle of wine after a football and Gaudi focused day. Boom! Day two is complete. After sunset head on back into the city and get some dinner, a drink and enjoy your evening before the day trip on day three. Montserrat deserves a mention on all Barcelona itineraries. I recommend trying to start this day trip as early as possible if you haven’t booked a tour online. If you aren’t a big hiker, you could be back in the city by early/mid-afternoon. If you love hiking, you’ll want to stay until sunset. 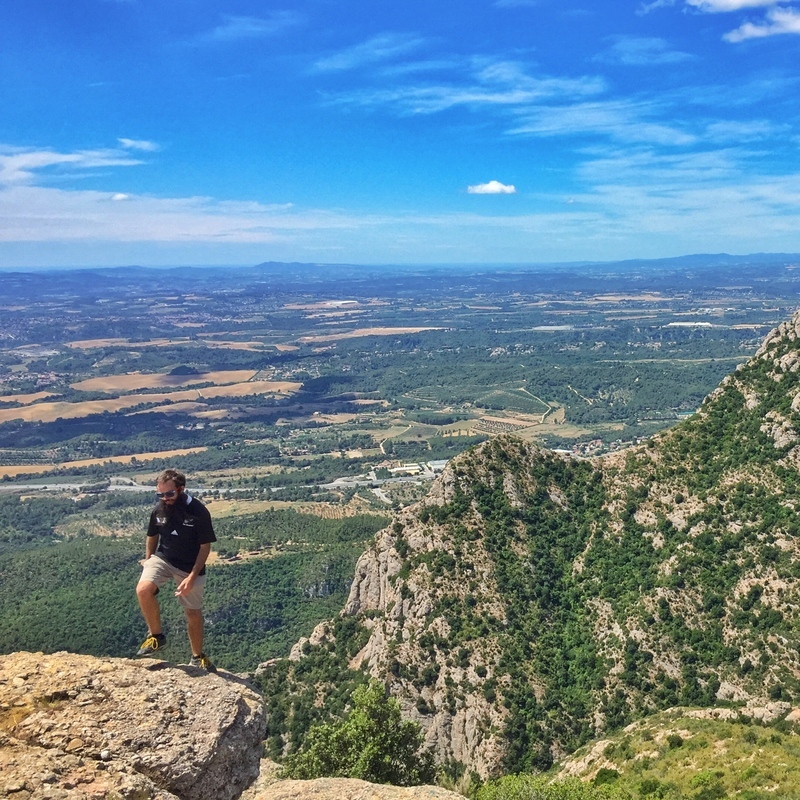 Besides the beautiful hiking trails with panoramic views from a variety of peaks (Sant Jeroni being the most popular), Montserrat is a Monastery and a religious site. There are many cafes at there though they are quite expensive so you can bring your own food up or get some snacks at the corner store which has also hiked up their prices compared to those in the city. You can read my full post on hiking Montserrat here. If you’ve rented a car and find yourself with plenty of time left in the day having experienced Montserrat you have a couple of other options that are convenient. Spain’s wine exports aren’t as large as neighbouring France so you may not be too familiar with Spanish wine. But don’t worry, the wine here holds its own and there are a bunch of wineries close to Montserrat you can visit before heading back to Barcelona. Sitges is on the coast 35km south of Barcelona and is an awesome place to walk around for a couple hours. With cobblestone streets, several beaches, cafes, bars, and restaurants you’ll have a lovely time. There are plenty of festivals on throughout the year here with the Gay Pride one of the most celebrated in the LGBT friendly city. If you’re a go-getter and want to fit in more activities and attractions, these are a few more ideas. Human Towers: If you happen to be in Barcelona at the right time, you might be able to squeeze in a trip to see people creating human towers in real life. Yes, like the ones you’ve seen in videos (and in the one above). They aren’t staged everyday but take a look at the calendars here and here and you might be able to make something work. For more information, I wrote a post about the human towers and the experience here. Hash Marihuana & Hemp Museum in Barcelona: I understand this won’t be for everyone, but as a non-smoker myself I actually enjoyed the museum a lot. There’s a lot of interesting information and artifacts as well as lots of pop culture references we can all relate to. Located in a 15th-century building, they renovated the place in the early 2000’s to prepare for the museums opening. Montjuic: Montjuic was tough to leave out on this itinerary. It’s another hill located close to the harbour with a funicular taking you to the top. With awesome views across Barcelona, there’s the Montjuic Castle which is the obvious place to start exploring. Montjuic was also home to many of the Olympic sporting events, with the Olympic Museum and cauldron other worthy spots to visit. The hill is sneaky large, so you could spend three or more hours up here. And voila! Just like that, three days in Barcelona have been completed. From beaches to architecture, lazing on the beach, to making the effort to catch sunset to learning about the city and eating up a storm, Barcelona will capture your heart. Aha Jub. Great to see your iconic shot at FCB make this post. Walking tour would be for me. I’d get lost a bit and see where the city took me. My wife enjoyed her time in Barcelona nearly a decade ago. She definitely dug the food quite a bit.